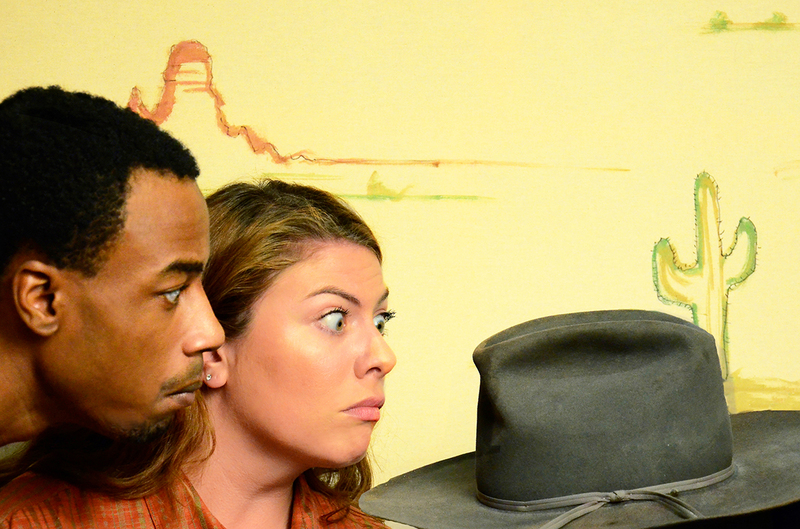 L to R: Gabriella Fernandez as Sun, Terry Bell as Kai, Amanda Roeder as Sizi, and Scott Sawa as Snake. All Production Photos by Suzanne Plunkett. *and* I caught my 10 year old having a good time too!" 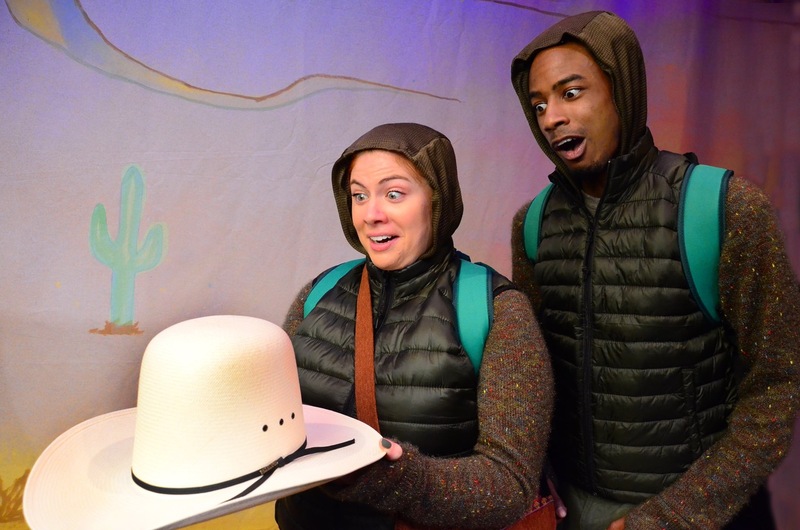 Lifeline Theatre’s production of We Found A Hat was the most pleasant family theatre experience I’ve had in the last year. 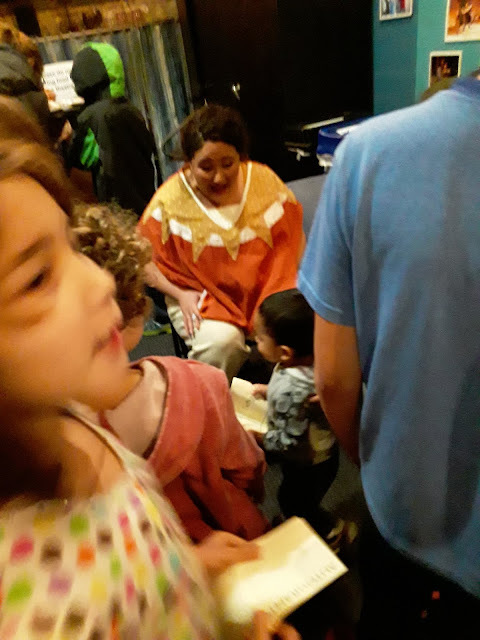 Specifically, it’s the first production my four-year-old hasn’t had to leave early, yet my older kids had a blast as well. The universal appeal was in the cleverness of the production and also in the fact that it’s a theme anyone can relate to: loved ones driven apart by desire and jealously. In this case two best-friend tortoises have their friendship challenged when, as they migrate through the desert, they come upon a hat that instills confidence and looks great on each of them. When I say the production was clever, I mean that we bought into the story exactly because the reality of being a bunch of audience members nearly head-to-head with a small group of actors on a stage the size of my living room with little kids occasionally making their loud contributions—well, they embraced all of that and made it part of the story. For example, the actors made a show of getting the set ready while people were settling in their seats. This was a nice pre-show to get us interested in what was to come and entertain little ones who are not known for sitting in a seat and staring at nothing—even for five minutes. Inventive costumes (e.g. 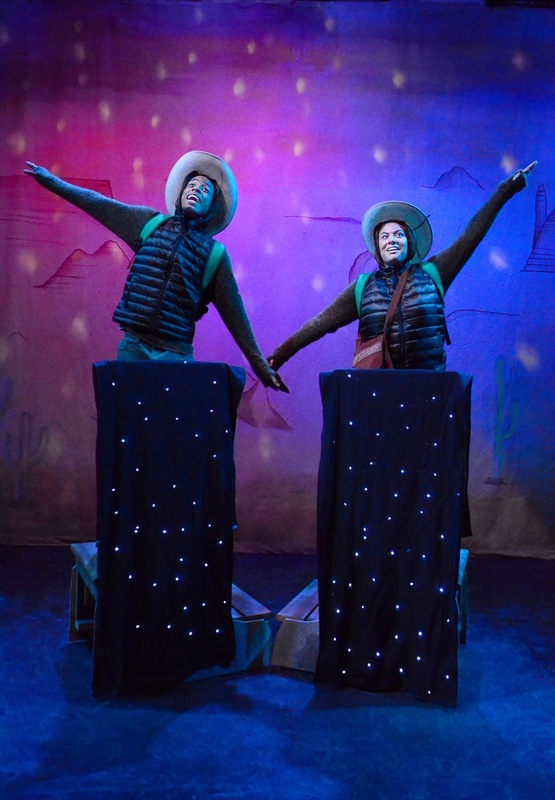 the fringe on a cowboy’s jacket and chaps standing in for cactus prickles and a sun/moon costume that enables one actor to quickly shift between embodying each of the celestial objects—oh, and such a cool snake costume/puppet!) 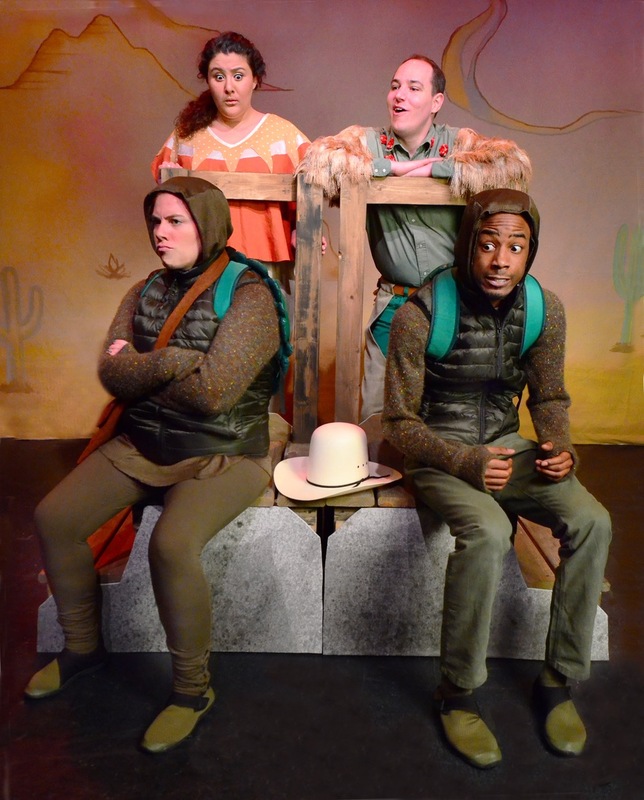 and use of props and actor’s bodies allowed us to delve into a vivid world of friendship being tested in the dramatically changing elements and landscape of a long desert journey. Some of our favorite scenes were the cactus gauntlet, a really cool dream sequence, and a dangerous storm (it was just scary enough—my 4-year-old was more afraid of the hand dryer in the bathroom). The actors threw themselves wholeheartedly into this ecosystem of inventiveness. Through the turtles (played by Terry Bell and Amanda Roeder), kids got to see the struggle of being the big or little one, of being labeled as creative or practical when your heart wants to explore all the possibilities of who you are. Gabriella Fernandez played Sun and Moon against Scott Sawa’s Cactus, and the two did a skilled and joyful job of embodying multiple elements and acting as a Greek chorus to give us some context on the tortoise’s friendship. They also taught us a bit about migration, water in the desert, and the difference between turtles and tortoises. 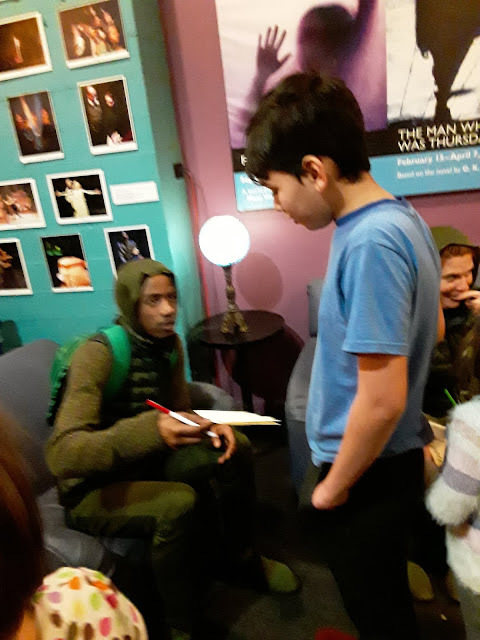 Your older children might groan before and after the show that it’s for little kids, but my 10-going-on-30-year-old caught my eye several times as we shared embedded jokes meant for the older members of the audience, and he got in line to have his program signed after the show. Out of 190 entries, congrats again to Tasha J, ChiIL Mama's 4-pack ticket winner ($60 Value). When my teens were tots, we were annual Lifeline Theatre KidSeries season subscribers. We've adored their amazing, original book based adaptations for decades. Their production values are excellent and they're one of our favorites for introducing young children to their first live theatre offerings. They truly are a lifeline for families, bringing stellar stories to life on stage, and often fostering a lifelong love of theatre arts. Lifeline Theatre’s KidSeries presents the world premiere of We Found A Hat, based on the children’s book by Jon Klassen, with adaptation by Lifeline Theatre ensemble member Jessica Wright Buha, lyrics by Jessica Wright Buha and John Szymanski, music by John Szymanski, and directed by Factory Theater Co-Artistic Director Manny Tamayo. Deep in the desert, two tortoises work together to overcome all obstacles the harsh landscape throws their way. Sizi and Kai are the best of pals and nothing ever comes between them... until one day they find a hat. They both look great in the hat. But they can’t both have the hat. A friendship is put to the test as the tortoises must find a way through their thorniest challenge yet. Explore the question of what we give up to support the ones we love in this adaptation of the 2016 book by Jon Klassen. We Found A Hat runs Through Sunday, Feb. 17, 2019 at Lifeline Theatre, 6912 N. Glenwood Ave. Regular performance times are Saturdays and Sundays at 11 a.m. and 1 p.m., with an added autism/sensory-friendly performance on Sunday, Feb. 3 at 3 p.m. (Previews are Saturday, Jan. 12 at 11 a.m. and 1 p.m.; and Sunday, Jan. 13 at 11 a.m.) Tickets are $15 and may be purchased at the Lifeline Theatre Box Office, 773.761.4477, or by visiting www.lifelinetheatre.com. Accessible Performances: The Saturday, Jan. 26, 11 a.m. performance will feature a pre-show touch tour of the set at 10 a.m. and live audio description for patrons who are blind or have low vision. The Sunday, Jan. 27, 11 a.m. and 1 p.m. performances will feature open captioning for patrons who are deaf or hard-of-hearing. And there will be an added autism/sensory-friendly performance on Sunday, Feb. 3 at 3 p.m. for patrons with social and/or cognitive disabilities. For more information about Lifeline’s accessibility services, please contact Accessibility Coordinator Erica Foster at 773.761.4477 x703 or at access@lifelinetheatre.com. PLUS: Join Lifeline Theatre every Saturday and Sunday at 12 p.m. during the run of We Found A Hat (following the 11 a.m. show, or before the 1 p.m. show) for our Stories Come Alive! Hour. Children will enjoy an interactive storytelling session and on-your-feet theatre games. The cost is only $5 per child. Reservations are recommended, though not required. Contact Lifeline Theatre at 773-761-4477 for more information. Guest artists Terry Bell (Kai), Gabriella Fernandez (Sun/Moon/Ensemble), Amanda Roeder (Sizi), and Scott Sawa (Cactus/Snake/Ensemble). With understudies Anna Connelly, Sophia Foldvari, Maddie Pell, and Matthew Schnitker. Lifeline Theatre ensemble member Jessica Wright Buha (Adaptor & Co-Lyricist); with guest artists Emma Cullimore (Costume & Properties Designer), Derik Marcussen (Costume & Properties Design Assistant), Jennifer McClendon (Production Manager), Kate Reed (Stage Manager), John Szymanski (Composer & Co-Lyricist), Eric Backus (Sound Designer), Joe Schermoly (Scenic Designer & Technical Director), Manny Tamayo (Director), Eric Watkins (Lightning Designer), and Jonah White (Master Electrician/A.V. Supervisor). 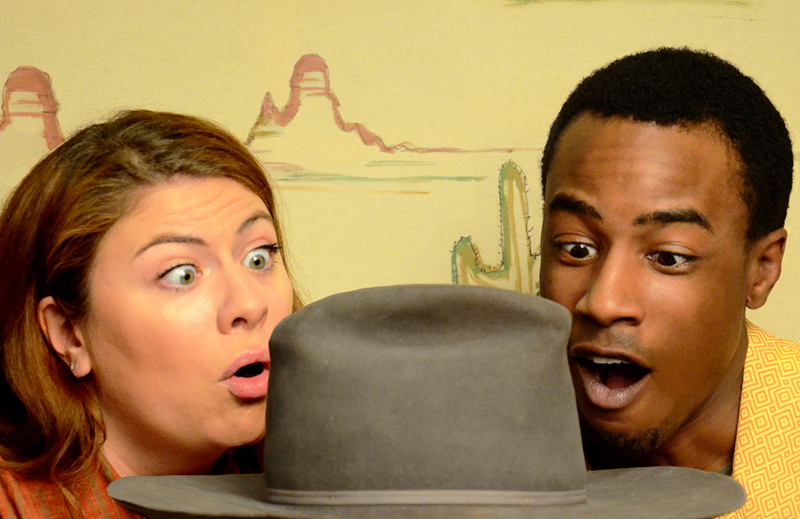 We Found A Hat runs Saturday, Jan. 12 – Sunday, Feb. 17, 2019 at Lifeline Theatre, 6912 N. Glenwood Ave. 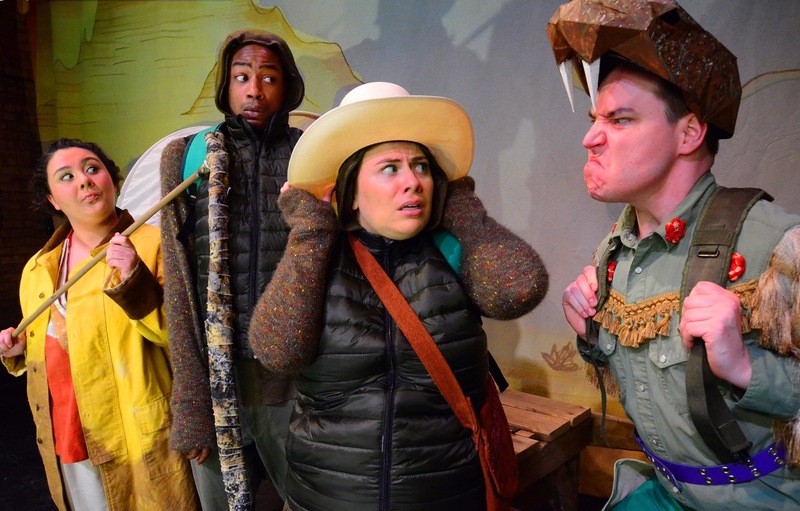 Regular performance times are Saturdays and Sundays at 11 a.m. and 1 p.m., with an added autism/sensory-friendly performance on Sunday, Feb. 3 at 3 p.m. (Previews are Saturday, Jan. 12 at 11 a.m. and 1 p.m.; and Sunday, Jan. 13 at 11 a.m.) Tickets are $15 and may be purchased at the Lifeline Theatre Box Office, 773.761.4477, or by visiting www.lifelinetheatre.com. Lifeline Theatre’s “We Found A Hat,” adapted by Jessica Wright Buha, directed by Manny Tamayo, based on the book by Jon Klassen; previews begin Saturday, January 12, 2019, running through Sunday, February 17. 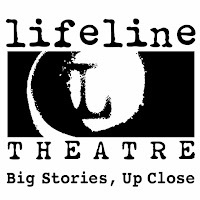 Lifeline Theatre is located at 6912 N. Glenwood Ave. Chicago, IL 60626. For tickets call the box office at 773-761-4477 or visit www.lifelinetheatre.com. Disclosure: Thanks to Lifeline Theatre for partnering up with ChiIL Mama and providing tickets for our giveaway and for review purposes. As always, all opinions are my own.